It seems that some politicians expressed as their view that the UN should act on Syria as quickly as on the Zwarte Piet (Black Pete) issue! A bit unfair given that smaller problems (and Black Pete is a comparatively small one) are easier to tackle and allow show some quick progress. While the popular feelings in my country of origin (the Netherlands) run high and are overwhelmingly against any changes in the Sinterklaas celebration, I personally feel that some chances would not do great harm. In fact, I think both parties are exaggerating. Those who think it is institutionalized racism have not experienced the celebration and seen the happy faces of small children, including black kids. Those who think this is purely hypersensitivity or political correctness gone overboard have never been discriminated on the basis of the color of their skin. 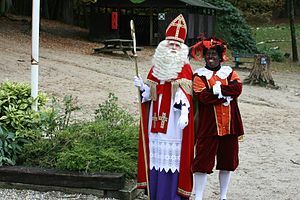 The Sinterklaas celebration is a marvelous and unique event that enthralls kids enormously. It is very old (17th century, I believe) but the ‘black Pete’ helper was added only around 1850. In view of the sensitivity of a minority of Dutch citizens and that of a majority of world citizens (however much they misunderstand the issue) it would not be great disaster if there were some more changes to accommodate ill-feelings. After all, few years ago the Dutch introduced women ‘black Petes’ – so why not another novelty: e.g. color them in a few different colors. In a decade from now nobody (especially small kids under 10 who are the only ones who believe in the good man!) will remember anything about all this history, the black color, the controversy. What should not be done is to abolish or condemn the whole Sinterklaas tradition on 5 December which is much bigger and richer than the relative minor issue of the color of the helper. PS In the informative piece of ABC News (see link below) there is an indication of the strong popular feeling in the Netherlands: a Facebook page seeking to preserve the clowns in blackface makeup known as “Black Petes” as part of the “Sinterklaas” childrens’ festival has become the fastest-growing Dutch language page ever, receiving a million ‘likes’ in a single day.